I’m aware that to most people ‘playing with’ (investigating) ontologies and isiZulu does not sound particularly useful on the face of it. Yet, there’s the some long-term future music, like eventually being able to generate patient discharge notes in one’s own language, which will do its bit to ameliorate the language barrier in healthcare in South Africa so that patients at least will adhere to the treatment instructions a little better, and therewith receive better quality healthcare. But benefits in the short-term might serve something as well. To that end, I proposed an honours project last year, which has been completed in the meantime, and one of the two interesting outcomes has made it into a publication already . As you may have guessed from the title, it’s about automation for language learning exercises. The results will be presented at the 6th Workshop on Controlled Natural Language, in Maynooth, Ireland in about 2 weeks time (27-28 August). In the remainder of this post, I highlight the main contributions described in the paper. First, regarding the post’s title, one might wonder what ontology verbalisation has to do with language learning. Nothing, really, except that we could reuse the algorithms from the controlled natural language (CNL) for ontology verbalisation to generate (computer-assisted) language learning exercises whose answers can be computed and marked automatically. That is, the original design of the CNL for things like pluralising nouns, verb conjugation, and negation that is used for verbalising ontologies in isiZulu in theory  and in practice , was such that the sentence generator is a detachable module that could be plugged in elsewhere for another task that needs such operations. Keet, C.M., Khumalo, L. Toward a knowledge-to-text controlled natural language of isiZulu. Language Resources and Evaluation, 2017, 51(1): 131-157. Keet, C.M. Xakaza, M., Khumalo, L. Verbalising OWL ontologies in isiZulu with Python. The Semantic Web: ESWC 2017 Satellite Events, Blomqvist, E. et al. (eds.). Springer LNCS vol. 10577, 59-64. 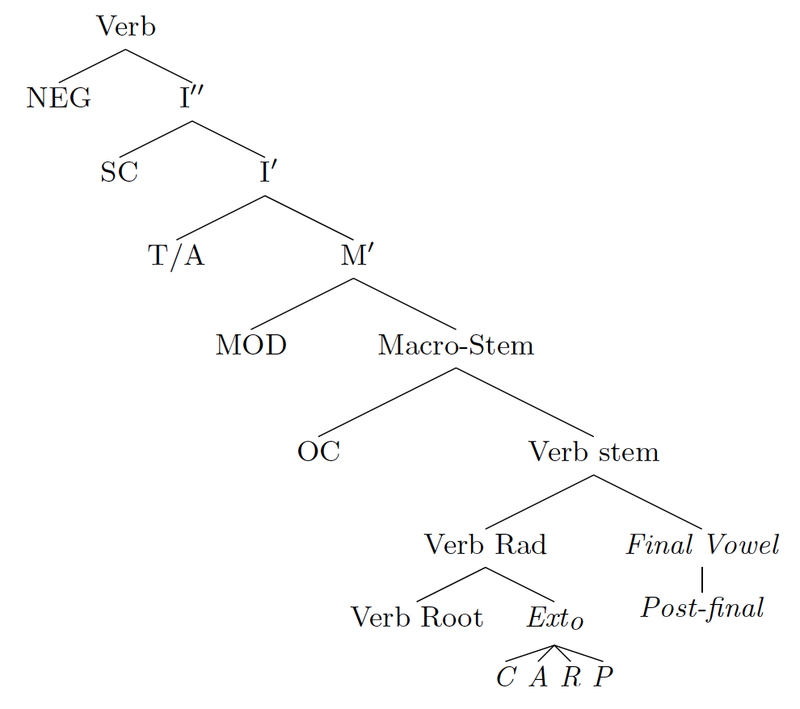 Gardent, C., Perez-Beltrachini, L. Using FB-LTAG Derivation Trees to Generate Transformation-Based Grammar Exercises. Proc. of TAG+11, Sep 2012, Paris, France. pp117-125, 2012. My first textbook “An Introduction to Ontology Engineering” (pdf) is just released as an open textbook. I have revised, updated, and extended my earlier lecture notes on ontology engineering, amounting to about 1/3 more new content cf. its predecessor. Its main aim is to provide an introductory overview of ontology engineering and its secondary aim is to provide hands-on experience in ontology development that illustrate the theory. Advanced topics that has a selection of sub-topics: Ontology-Based Data Access, interactions between ontologies and natural languages, and advanced modelling with additional language features (fuzzy and temporal). Each chapter has several review questions and exercises to explore one or more aspects of the theory, as well as descriptions of two assignments that require using several sub-topics at once. More information is available on the textbook’s page [also here] (including the links to the ontologies used in the exercises), or you can click here for the pdf (7MB). Feedback is welcome, of course. Also, if you happen to use it in whole or in part for your course, I’d be grateful if you would let me know. Finally, if this textbook will be used half (or even a quarter) as much as the 2009/2010 blogposts have been visited (around 10K unique visitors since posting them), that would mean there are a lot of people learning about ontology engineering and then I’ll have achieved more than I hoped for. UPDATE: meanwhile, it has been added to several open (text)book repositories, such as OpenUCT and the Open Textbook Archive, and it has been featured on unglue.it in the week of 13-8 (out of its 14K free ebooks). South Africa has 11 official languages with English as the language of business, as decided during the post-Apartheid negotiations. In practice, that decision has resulted in the other 10 being sidelined, which holds even more so for the nine indigenous languages, as they were already underresourced. This trend runs counter to the citizens’ constitutional rights and the state’s obligations, as she “must take practical and positive measures to elevate the status and advance the use of these languages” (Section 6 (2)). But the obligations go beyond just language promotion. Take, e.g., the right to have access to the public health system: one study showed that only 6% of patient-doctor consultations was held in the patient’s home language, with the other 94% essentially not receiving the quality care they deserve due to language barriers. Learning 3-4 languages up to practical multilingualism is obviously a step toward achieving effective communication, which therewith reduces divisions in society, which in turn fosters cohesion-building and inclusion, and may contribute to achieve redress of the injustices of the past. This route does tick multiple boxes of the aims presented in the National Development Plan 2030. How to achieve all that is another matter. Moreover, just learning a language is not enough if there’s no infrastructure to support it. For instance, what’s the point of searching the Web in, say, isiXhosa when there are only a few online documents in isiXhosa and the search engine algorithms can’t process the words properly anyway, hence, not returning the results you’re looking for? Where are the spellcheckers to assist writing emails, school essays, or news articles? Can’t the language barrier in healthcare be bridged by on-the-fly machine translation for any pair of languages, rather than using the Mobile Translate MD system that is based on canned text (i.e., a small set of manually translated sentences)? Research is being carried out to devise Human Language Technologies (HLTs) to answer such questions and contribute to realizing those aspects of the NDP. This is not simply a case of copying-and-pasting tools for the more widely-spoken languages. For instance, even just automatically generating the plural noun in isiZulu from a noun in the singular required a new approach that combined syntax (how it is written) with semantics (the meaning) through inclusion of the noun class system in the algorithms [summary]. In contrast, for English, just syntax-based rules can do the job (more precisely: regular expressions in a Perl script). Rule-based approaches are also preferred for morphological analysers for the regional languages, which split each word into its constituent parts, and for natural language generation (NLG). An NLG system generates natural language text from structured data, information, or knowledge, such as data in spreadsheets. A simple way of realizing that is to use templates where the software slots in the values given by the data. This is not possible for isiZulu, because the sentence constituents are context-dependent, of which the idea is illustrated in Figure 1. Figure 1. Illustration of a template for the ‘all-some’ axiom type of a logical theory (structured knowledge) and some values that are slotted in, such as Professors, resp. oSolwazi, and eat, resp. adla and zidla; ‘nc’ denotes the noun class of the noun, which governs agreement across related words in a sentence. The four sample sentences in English and isiZulu represent the same information. Therefore, a grammar engine is needed to generate even the most basic sentences correctly. 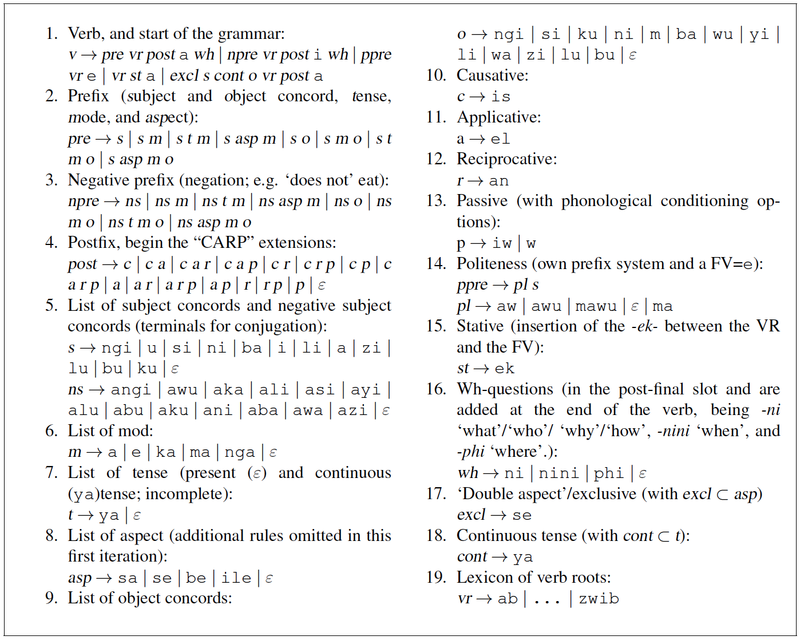 The core aspects of the workflow in the grammar engine [summary] are presented schematically in Figure 2, which is being extended with more precise details of the verbs as a context-free grammar [summary]. Such NLG could contribute to, e.g., automatically generating patient discharge notes in one’s own language, text-based weather forecasts, or online language learning exercises. Figure 2. The isiZulu grammar engine for knowledge-to-text consists conceptually of three components: the verbalisation patterns with their algorithms to generate natural language for a selection of axiom types, a way of representing the knowledge in a structured manner, and the linking of the two to realize the generation of the sentences on-the-fly. It has been implemented in Python and Owlready. The rules-based approach is known to be resource-intensive. Therefore, and in combination with the recent Big Data hype, data-driven approaches with lost of text are on the rise: it offers the hope to achieve more with less effort, not even having to learn the language, and easier bootstrapping of tools for related languages. This can work, provided one has a lot of good quality text (a corpus). Corpora are being developed, such as the isiZulu National Corpus, and the recently established South African Centre for Digital Language Resources (SADiLaR) aims to pool the resources. We investigated the effects of a corpus on the quality of an isiZulu spellchecker [summary], which showed that learning the statistics-driven language model on old texts like the bible does not transfer well to modern-day texts such as news items, nor vice versa. The spellchecker has about 90% accuracy in single-word error detection and it seems to contribute to the intellectualisation of isiZulu [summary]. Its algorithms use trigrams and probabilities of their occurrence in the corpus to compute the probability that a word is spelled correctly, illustrated in Figure 3, rather than a dictionary-based approach that is impractical for agglutinating languages. The algorithms were reused for isiXhosa simply by feeding it a small isiXhosa corpus: it achieved about 80% accuracy already even without optimisations. Data-driven approaches are also pursued in information retrieval to, e.g., develop search engines for isiZulu and isiXhosa. Algorithms for data-driven machine translation (MT), on the other hand, can easily be misled by out-of-domain training data of parallel sentences in both languages from which it has to learn the patterns, such as such as concordial agreement like izi- zi- (see Figure 1). In one of our experiments where the MT system learned from software localization texts, an isiXhosa sentence in the context of health care, Le nto ayiqhelekanga kodwa ngokwenene iyenzeka ‘This is not very common, but certainly happens.’ came out as ‘The file is not valid but cannot be deleted.’, which is just wrong. We are currently creating a domain-specific parallel corpus to improve the MT quality that, it is hoped, will eventually replace the afore-mentioned Mobile Translate MD system. It remains to be seen whether such a data-driven MT or an NLG approach, or a combination thereof, may eventually further alleviate the language barriers in healthcare. Because of the ubiquity of ICTs in all of society in South Africa, HLTs for the indigenous languages have become a necessity, be it for human-human or human-computer interaction. Profit-driven multinationals such as Google, Facebook, and Microsoft put resources into development of HLTs for African languages already. Languages, and the identities and cultures intertwined with them, are a national resource, however; hence, suggesting the need for more research and the creation of a substantial public good of a wide range of HLTs to assist people in the use of their language in the digital age and to contribute to effective communication in society. Levin, M.E. Language as a barrier to care for Xhosa-speaking patients at a South African paediatric teaching hospital. S Afr Med J. 2006 Oct; 96 (10): 1076-9. Hussey, N. The Language Barrier: The overlooked challenge to equitable health care. SAHR, 2012/13, 189-195. Byamugisha, J., Keet, C.M., Khumalo, L. Pluralising Nouns in isiZulu and Related Languages. 17th International Conference on Intelligent Text Processing and Computational Linguistics (CICLing’16). A. Gelbukh (Ed.). Springer LNCS vol 9623, pp. April 3-9, 2016, Konya, Turkey. Pretorius, L. & Bosch, S.E. Enabling computer interaction in the indigenous languages of South Africa: The central role of computational morphology. ACM Interactions, 56 (March + April 2003). Keet, C.M. Xakaza, M., Khumalo, L. Verbalising OWL ontologies in isiZulu with Python. The Semantic Web: ESWC 2017 Satellite Events, Blomqvist, E et al. (eds.). Springer LNCS vol 10577, 59-64. Keet, C.M., Khumalo, L. Grammar rules for the isiZulu complex verb. Southern African Linguistics and Applied Language Studies, 2017, 35(2): 183-200. L. Khumalo. Advances in Developing corpora in African languages. Kuwala, 2015, 1(2): 21-30. 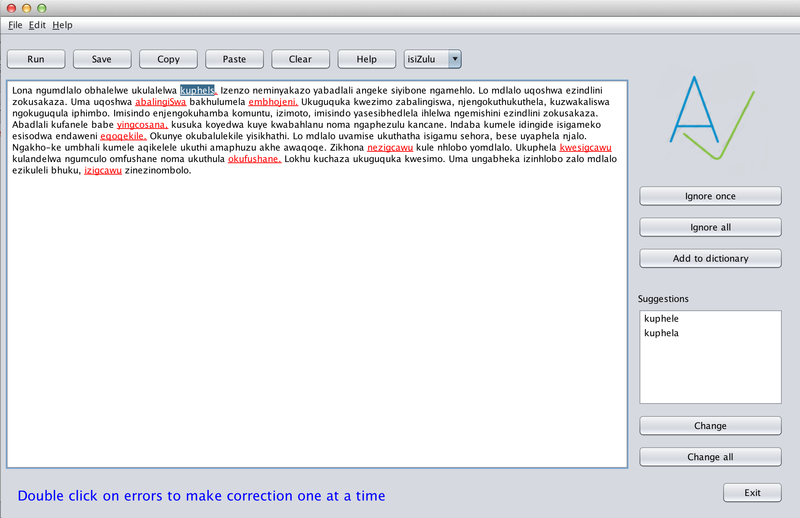 Ndaba, B., Suleman, H., Keet, C.M., Khumalo, L. The effects of a corpus on isiZulu spellcheckers based on N-grams. In IST-Africa.2016. (May 11-13, 2016). IIMC, Durban, South Africa, 2016, 1-10. Malumba, N., Moukangwe, K., Suleman, H. AfriWeb: A Web Search Engine for a Marginalized Language. Proceedings of 2015 Asian Digital Library Conference, Seoul, South Korea, 9-12 December 2015. The error corrector can propose possible corrections for single-word errors that are either transpositions, substitutions, insertions, or deletions. So, for instance, *eybo, *yrbo, *yeebo, and *ybo, respectively, cf. the correctly spelled yebo ‘yes’. It doesn’t perform equally well on each type of typo yet, with the best results obtained for transpositions. As with the error detector, it relies on a data-driven approach, with, for error correction, a lot more statistics-based algorithms cf. the error detection-only algorithms. They are described in detail in Frida Mjaria’s 2017 CS honours project. Suggestion accuracy (i.e., that it at least can suggest something) is 95% and suggestion relevance (that it contains the intended word) made it to 61%, mainly due to weak results of corrections for insertion errors (they mess too much with the trigrams). The error detection accuracy has been improved mainly through better handling of punctuation, thanks to Norman Pilusa’s programming efforts. This was done through a series of rules on top of the data-driven approach, for it is too hard to learn those from a large corpus. For instance, semi-colons, end-of-sentence periods, and numbers (written in isiZulu like, e.g., ngu-42 rather than just 42) are now mostly ignored rather than the words adjacent to it being detected as probably misspelt. It works better than spellchecker.net’s version, which is the only other available isiZulu spellchecker: on a random selection of actual pieces of text, our tool obtained 91.71% lexical recall for error detection, whereas the spellchecker.net’s version got to 82.66% on the same text. Put differently: spellchecker.net flagged about twice as many words as incorrect as ours did (so there wasn’t much point in comparing error corrections). Finally, because all the algorithms are essentially language-independent (ok, there’s an underlying assumption of using them for highly agglutinative languages), we fed the algorithms a large isiXhosa corpus that is being developed as part of another project, and incorporated that into the spellchecker. There’s room for some fine-tuning especially for the corrector, but at least now there is one, thanks to Norman Pilusa’s software development contributions. That we thought we could get away with this approach is thanks to Nthabiseng Mashiane’s 2017 CS honours project, which showed that the results would be fairly good (>80% error detection) with more data. We also tried a rules-based approach for isiXhosa. It obtained better accuracies than the statistical language model of Nthabiseng, but only for those parts of speech covered by the rules, which is a subset of all types of words. If you’re interested in those rules, please check out Siseko Neti’s 2017 CS Honours project. To the best of my knowledge, it’s the first time those rules have been formally represented in a computer-usable format and they may be useful for other endeavours, such as morphological analysers. A section of the isiXhosa Wikipedia entry about the UN (*ukuez should be ukuze, which is among the proposed words). Further improvements are possible, which are being scoped for a v3 some time later. For instance, for the linguists and language scholars: what are the most common typos? What are the most commonly used words? If we had known that, it would have been an easy way to boost the performance. Can we find optimisations to substitutions, insertions, and deletions similar to the one for transpositions? Should some syntax rules be added for further optimisation? These are some of the outstanding questions. If you’re interested in that or related questions, or you would like to use the algorithms in your tool, please contact me. Temporal conceptual models, ontologies, and their logics are nothing new, but that sort of information and knowledge representation still doesn’t gain a lot of traction (cf. say, formal methods for verification). This is in no small part because modelling temporal information is not easy. Several conceptual modelling languages do have various temporal extensions, but most modellers don’t even use all of the default language features yet . How could one at least reduce the barrier to adoption of temporal logics and modelling languages? The two principle approaches are visualisation with a diagrammatic language and rendering it in a (pseudo-)natural language. One of my postgraduate students looked at the former, trying to figure out what would be the best icons and such, which showed there was still a steep learning curve . Before examining whether that could be optimised, I wondered whether the natural language option might be promising. The problem was, that no-one had yet tried to determine what the natural language counterpart of the temporal constraints were supposed to be, let alone whether they be ‘adequate’ or the ‘best’ way of rendering the temporal constraints in tolerable natural language sentences. I wanted to know that badly enough that I tried to find out. Given that using templates is a tried-and-tested relatively successful approach for atemporal conceptual models and ontologies (e.g., for ORM, the ACE system), it makes sense to do something similar, but then for some temporal extension. As temporal conceptual modelling language I used one that has a Description Logics foundation (DLRUS [3,4]) for that easily links to ontologies as well, added a few known temporal constraints (like for relationships/DL roles, mandatory) and removing others (some didn’t seem all that interesting), which resulted in 34 constraints, still. For each one, I tried to devise more and less reasonable templates, resulting in 101 templates overall. Those templates were evaluated on semantics and preference by three temporal logic experts and five ‘mixed experts’ (experts in natural language generation, logic, or modelling). This resulted in a final set of preferred templates to verbalise the temporal constraints. The remainder of this post first describes a bit about the templates and then the results of which I think they are most interesting. The basic idea of a template—in the context of the verbalisation of conceptual models and ontologies—is to have some natural language for the constraint where then the vocabulary gets slotted in at runtime. Take, for instance, simple named class subsumption in an ontology, , for which one could define a template “Each [C] is a(n) [D]”, so that with some axiom , it would generate the sentence “Each Manager is an Employee”. One also could have devised the template “All [C] are [D]” and then it would have generated “All Managers are Employees”. The choice between the two templates in this case is just taste, for in both cases, the semantics is the same. More complex axioms are not always that straightforward. For instance, for the axiom type , would “Each [C] [R] some [D]” be good enough, or would perhaps “Each [C] must [R] at least one [D]” be better? E.g., “Each Professor teaches some Course” vs “Each Professor must teach at least one Course”. If an object is an instance of entity type [C], then there is some time where it is not a(n) [C]. [C] is an entity type whose objects are, for some time in their existence, not instances of [C]. [C] is an entity type of which each object is not a(n) [C] for some time during its existence. All instances of entity type [C] are not a(n) [C] for some time. Each [C] is not a(n) [C] for some time. Each [C] is for some time not a(n) [C]. Which one(s) do you think captures the semantics, and which one(s) do you prefer? Each ..C_1.. ..R_1.. ..C_2.. was preceded by ..C_1.. ..R_2.. ..C_2.. some time earlier. Each ..C_1.. ..R_1.. ..C_2.. must be preceded by ..C_1.. ..R_2.. ..C_2.. .
I’m not saying they are all correct; they were some of the options given, which the participants could choose from and comment on. The full list of constraints and template options are available in the supplementary material, which also contains a file where you can fill in your own answers, see what the (anonymised) participants said, and it has the final list of ‘best’ constraints. The main aggregate quantitative results are shown in the following table. Many observations can be made from the data (see the paper for details). Some of the salient aspects are that there was low inter-annotator agreement among the experts, despite that they know each other (temporal logics is a small community) and that the ‘mixed group’ deemed many sentences correct that the experts deemed wrong in the sense of not properly capturing the semantics of the constraint. Put differently, it looks like the mixed experts, as a group, did not fully grasp some subtle distinction in the temporal constraints. With respect to the templates, the preferred ones don’t follow the structure of the logic, but are, in a way, a separate rendering, or: there’s no neat 1:1 mapping between axiom type and template structure. That said, that doesn’t mean that they always chose the shortest template: the experts definitely did not, while the mixed experts leaned a bit toward preferring templates with fewer words even though they were surely not always the semantically correct option. It may not look good that the experts preferred different templates, but in a follow-up interview with one of the experts, the expert noted that it was not really a problem “for there is the logic that does have the precise meaning anyway” and thus “resolves any confusion that may arise from using slightly different terminology”. The temporal logic expert does have a point from the expert’s view, fair enough, but that pretty much defeats my aim with the experiment. Asking more non-experts may not be a good strategy either, for they are, on average, too lenient. So, for now, we do have a set of, relatively, ‘best’ templates to verbalise temporal constraints in temporal conceptual models and ontologies. The next step is to compare that with the diagrammatic representation. This we did , and I’ll describe those results informally in a next post. I’ll present more details at the upcoming CREOL: Contextual Representation of Events and Objects in Language Workshop that is part of the Joint Ontology Workshops 2017, which will be held next week (21-23 September) in Bolzano, Italy. As the KRDB group at FUB in Bolzano has a few temporal logic experts, I’m looking forward to the discussions! Also, I’d be happy if you would be willing to fill in the spreadsheet with your preferences (before looking at the answers given by the participants! ), and send them to me. Keet, C.M., Fillottrani, P.R. An analysis and characterisation of publicly available conceptual models. 34th International Conference on Conceptual Modeling (ER’15). Johannesson, P., Lee, M.L. Liddle, S.W., Opdahl, A.L., Pastor López, O. (Eds.). Springer LNCS vol 9381, 585-593. 19-22 Oct, Stockholm, Sweden. T. Shunmugam. Adoption of a visual model for temporal database representation. M. IT thesis, Department of Computer Science, University of Cape Town, South Africa, 2016. A. Artale, E. Franconi, F. Wolter, and M. Zakharyaschev. A temporal description logic for reasoning about conceptual schemas and queries. In S. Flesca, S. Greco, N. Leone, and G. Ianni, editors, Proceedings of the 8th Joint European Conference on Logics in Artificial Intelligence (JELIA-02), volume 2424 of LNAI, pages 98-110. Springer Verlag, 2002. A. Artale, C. Parent, and S. Spaccapietra. Evolving objects in temporal information systems. Annals of Mathematics and Artificial Intelligence, 50(1-2):5-38, 2007. Keet, C.M. Natural language template selection for temporal constraints. CREOL: Contextual Representation of Events and Objects in Language, Joint Ontology Workshops 2017, 21-23 September 2017, Bolzano, Italy. CEUR-WS Vol. (in print). The ba is the subject concord (~conjugation) to match with the noun class (which is 2) of the noun that plays the subject in the sentence (abashana), the ya denotes a continuous action (‘are doing something’ in the present), the zi is the object concord for the noun class (8) of the noun that plays the object in the sentence (izimpahla), theng is the verb root, then comes the CARP extension with is the causative (turning ‘buy’ into ‘sell’), and el the applicative and an the reciprocative, which take care of the ‘to each other’, and then finally the final vowel a.
where NEG is the negative; SC the subject concord; T/A denotes tense/aspect; MOD the mood; OC the object concord; Verb Rad the verb radical; C the causative; A the applicative; R the reciprocal; and P the passive. For instance, if the children were not selling the clothes to each other, then instead of the SC, there would be the NEG SC in that position, making the verb abayazithengiselana. To make sense of all this in a way that it would be amenable to computation, we—my co-author Langa Khumalo and I—specified the grammar of the complex verb for the present tense in a CFG using an incremental process of development. To the best of our (and the reviewer’s) knowledge, the outcome of the lengthy exercise is (1) the first comprehensive and precisely formulated documentation of the grammar rules for the isiZulu verb present tense, (2) all together in one place (cf. fragments sprinkled around in different papers, Wikipedia, and outdated literature (Doke in 1927 and 1935)), and (3) goes well beyond handling just one of the CARP, among others. The figure below summarises those rules, which are explained in detail in the forthcoming paper “Grammar rules for the isiZulu complex verb”, which will be published in the Southern African Linguistics and Applied Language Studies  (finally in print, yay!). It is one thing to write these rules down on paper, and another to verify whether they’re actually doing what they’re supposed to be doing. Instead of fallible and laborious manual checking, we put them in JFLAP (for the lack of a better alternative at the time; discussed in the paper) and tested the CFG both on generation and recognition. The tests went reasonably well, and it helped fixing a rule during the testing phase. Because the CFG doesn’t take into account phonological conditioning for the vowels, it generates strings not in the language. Such phonological conditioning is considered to be a post-processing step and was beyond the scope of elucidating and specifying the rules themselves. There are other causes of overgeneration that we did not get around to doing, for various reasons: there are rules that go across the verb root, which are simple to represent in coding-style notation (see paper) but not so much in a CFG, and rules for different types of verbs, but there’s no available resource that lists which verb roots are intransitive, which as monosyllabic and so on. We have started with scoping rules and solving issues for the latter, and do have a subset of phonological conditioning rules; so, to be continued… For now, though, we have completed at least one of the milestones. Last, but not least, in case you wonder what’s the use of all this besides the linguistics to satisfy one’s curiosity and investigate and document an underresourced language: natural language generation for intelligent user interfaces in localised software, spellcheckers, and grammar checkers, among others.